• Everywhere you look, you see beautifully landscaped lawns and gardens. • You have a security guard to welcome everyone that comes through the gate. • You can drive your golf cart to have dinner at the club. • You have a built-in social calendar. Events are scheduled for you every month! • No need to have a pool built into your back yard---The pool at the club is available to you and you don’t even have to maintain and clean it! • You may get hit with a stray golf ball while drinking your morning coffee on the back deck. • With all the lush landscaping, it is hard to see what your neighbors are cooking on their grill next door. • You will have to learn to accept the fashion rules you learned as a kid, no longer apply. As it turns out, it is actually ok to mix patterns. And no colors are off limits. • You will need to learn to speak the language: Bogey does not have anything to do with monsters and bad men, and eagles are not birds. • If you are a free-spirit, and don’t like people telling you what to do, you may not like that you have to learn and follow the rules. For example: USGA’s Rule 1: “The Game of Golf consists of playing a ball with a club from the teeing ground into the hole by a stroke or successive stroked in accordance with the rules.” In other words, I think this means you are supposed to play golf with a golf ball, a golf club and a tee, and you have to swing at the ball to hit it into a hole. You need to know this. • Golfers need to concentrate. So you have to be quiet. For some, this is more difficult than others. Translations: no loud parties, breakdancing and fireworks in your back yard. And no noisy chit chat on the fairway. • You are not allowed to have chickens, goats or other livestock. Again, noise can be a distraction for the golfers. Gated and golf course communities aren’t for everyone, but if you are looking for a fabulous home on the golf course that is stately and beautiful, you will want to take the time to see this home. It is a 4 bedroom, 3.5 bath home with 3,510 square feet. Priced at $443,000. Want to see inside? Click the link below! I was talking with my 28-year old daughter the other day about her upcoming visit to Charleston, Easter weekend. She is so excited about coming, especially since she is bringing a friend with her. We were discussing the plans for the Easter Egg Hunt and party we are going to have, meals we are going to make together, places to go, things to do, and...EASTER BASKETS! I told her, "Oh, about that...Don't worry...I will make sure the Easter bunny is well prepared to fill baskets for them, as well as our other friends that will be staying with us for the weekend." "Mom! Are you serious?!? You are going to make her an Easter Basket? THAT is why my friends always say, 'Your mom is so EXTRA!'" It doesn't take much to make someone feel special. People want to feel like you are paying attention to what is important to them. They want to know you care. They want to know you are focused and paying attention to what they like and what they don't. They want to know you took the time to plan and prepare to be with them. It isn't hard. It just requires stepping outside of your own world and being present in theirs. 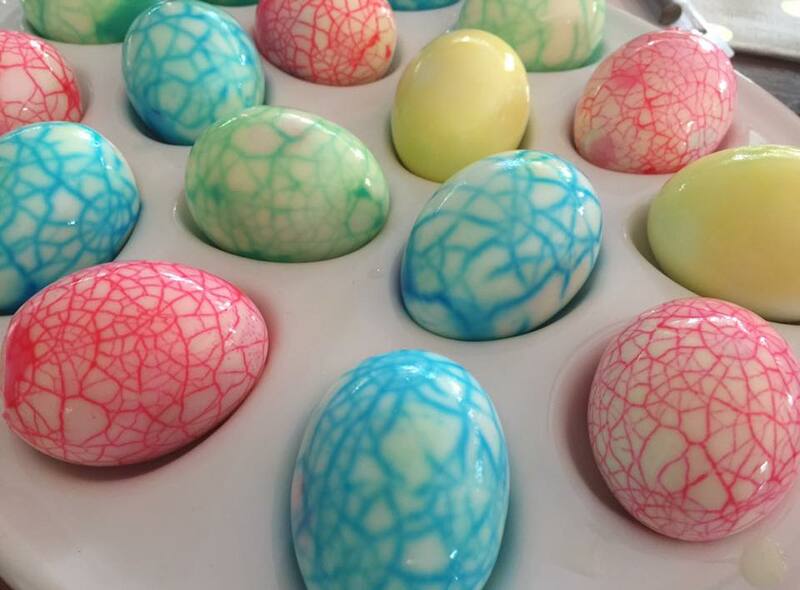 So here's something EXTRA we are going to do when my daughter and friends get here: Make these gorgeous eggs! You just take hard-boiled eggs and leaving the shells on, carefully crack the entire surface. Put the unpeeled eggs into separate glasses or Ziploc bags. Cover with water and 10 drops of food coloring, place in the refrigerator, and let them sit overnight. The next day, carefully discard the colored water, rinse and peel the eggs. Super easy, and SO impressive! What can YOU do to be EXTRA? Stay tuned for more Easter ideas! If living in a community with all the amenities within walking distance (or a short golf cart ride) is what you are in the market for, you must consider this home! It is 4 bedrooms, 3.5 bathrooms, 3,510 square feet and priced at $450,000. I am just a phone call away to set up an appointment to see this beautiful home!